Anybody will tell you "Content is King," but what king has ever lived alone? The best content in the world, in isolation, is nothing. In this post I'm going to recommend three books that will help you understand how to craft fine content, and how it spreads. I'll share some of the more compelling things I've learned from each book. This should be the first book any webmaster reads; an instruction manual on how information spreads. When I write the word contagious, you probably think of the flu, HIV, and sickness in general. What we don't realize is that information itself is - or at least can be contagious. Everybody knows about The Midnight Ride of Paul Revere. Was this a case of a charismatic personality that could spellbind the masses with any message ... or was the news "the British are coming" so important and unusual that the information spread itself? "Linkbait" is a time honored SEO tactic. By creating something helpful and unique, we hope to attract readers, viewers, or users, some of who run blogs and link to us. We create the content hoping that it spreads itself, like any contagious thing, but a positive one. This should be part of any site's marketing strategy. But the information itself is only half the equation. The book draws heavily on the concept known as Six Degrees of Separation. The world is a social, inter-connected place. We all play our own special role in the social fabric, but there are "connectors," people who seem to know everyone. They seem to, because they do. Once you've perfected your message, your content, your site, these social mavens are the people you need to impress. Only the ones who are genuinely interested in what you have to say; if we're comparing information to a [positive] virus, your strain must target a carrier, a host to pass along the message. 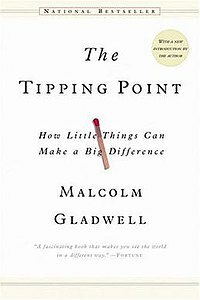 To learn pore, you may find these Wikipedia articles useful: Tipping Point, about the concept in the book; and The Tipping Point, about the book itself. You would still improve your site with a visit to the library, but these articles can help you find the most important information without leaving your seat. I've been reading this book on a recommendation from a friend. The book describes the differences and similarities between the human and animal minds. It's the story of our evolution as a species, and from awareness of the world around us, to awareness of the world inside our minds. The author's theory, like many who came before him ( notably Aldus Huxley in The Doors of Perception ), is that language more than anything else sets us apart from the lower animals. So far the most compelling thing I've learned is the difference between our attention span, which might be an hour, and what scientists call "working memory," which lasts five to ten seconds. This is something like short-term memory, having a lot to do with the way information is sent across the brain. Neurological networks of "lit up" cells carrying an idea to the center of our attention last a very short time before a newer "net" overpowers them. Taking the step further, and looking back "toward evolutionary times," nature seems to have tuned us to be easily distracted. Imagine a rabbit enjoying a nice meal; it won't take its eyes off the horizon, looking out for a hawk or fox that might want to make a meal out of it. Our lives are no longer in constant danger, but this tendency to distraction - you may have noticed a car driving by while reading this, a loud neighbor, or something else that wasn't important, then come back to read the rest of this post - should be taken into account when you build your site's pages. We don't forget out life story every few seconds, but we find the world around us naturally interesting. Your content needs to be even more fascinating, or important, to hold a viewer's attention with so much competition ... most of it not even from other web sites. Your content should be as short as possible while getting your point across, but it needs to be compelling throughout - not just the first sentence. This book actually doesn't contain any secrets to building web sites that stick to their viewers' minds like an unforgettable song. It's just a wonderful example of writing that's hard to put down, even with all of life's distractions. Jon Krakaur writes the story of Mt Everest's worst disaster, with perhaps a dozen climbers' accidental deaths. The man himself was on the mountain, on assignment for a magazine he was writing for, back in the time when information was distributed on paper, before the web. The man is a master of engaging his reader; you feel like you're freezing on the side of the mountain. Most of us have a different message to convey, but want to do as good a job. This is one of my Seattle photographs, of "Pike's Place" aka the "Public Market," a popular tourist destination on the northern corner of downtown. As described under The Tipping Point, it was the combination of this unusual photograph and Matt Cutt's endorsement that created a minor explosion in traffic to my site. The streaks of light at the bottom of the frame are headlights from a car passing by while the shutter was open; the streaks through the sky are stars showing the movement of our planet, rotating on its axis. I'm glad to see Ape That Spoke on your list - I've been telling people what a great book that is for years. It's important to know the mechanics of how communication works between people, if you're going to communicate through a web site. The Tipping Point - I agree, 100% and any Huxley :). The Tipping Point and Into Thin Air are two of my favorite books. I must be an SEO. the last I read was Facebook Marketing, leverage Social Media to Grow your Business, written by Steven Holzner. it explains how social media are a great source of potential customers, but also he gives some tips to boost your business using facebook. I recommend it.